SHAWMERE is located in Eastern Ontario, Canada, about half way between Toronto and Montreal. It is 15 miles or 24 kilometers North of Highway 401, and the Thousand Islands International Bridge which links Canada to the Northern end of US Interstate 81. 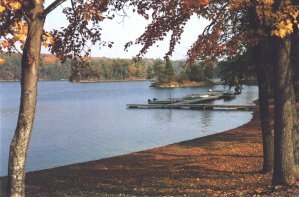 It is located between the villages of Lyndhurst and Lansdowne, on Red Horse Lake, one of an 18 mile long chain of lakes that comprise the Upper Gananoque River System. From the Thousand Islands Bridge, continue North to Highway 401, then West one half-mile to next exit. From Highway 401, take Exit 659 (Reynolds Road North), follow County Road 3 through the towns of Lansdowne and Outlet, to LaRose Bay Road. Turn right and follow signs to Shawmere. Self-contained cottages with screened porches, three-piece baths, and fully equipped kitchens. Compliance with Ontario drinking water regulations. Private sand beach, clean and safe for children. Boat ramp to launch your own boat. Sorry, but we do not permit pets. Gasoline and oil for boats. Live bait and fishing tackle. during the weeks starting August 19 and August 26, 2017. The 2017 spring off-season ends June 17. The 2017 fall off-season begins September 2. .
Prices are all in Canadian Dollars. or cooking fuel used in the cottage. Bring your own sheets or sleeping bags, towels and bathmats, and all consumables. for more information about renting a boat or bringing your own boat. See the boating page. From the opening of Bass season to the Saturday of Labor Day weekend (June 17 to Sept. 2, 2017), the minimum reservation is one full week, beginning and ending Saturday morning. Before the opening of Bass season in the spring, and after Labor Day in the fall, shorter reservations are usually available. The minimum charge for a cottage is two nights' rent. A deposit of at least 30% of the rent will be required on all cottage, boat, and motor reservations. We will mail a request for the deposit at the appropriate time. A statement of our deposit refund policy will be included with the deposit request. We allow within one percent of the current bank exchange rate on all U.S. funds. When making inquiries by regular mail, please provide us with your home phone number or e-mail address so we can respond quickly if we have the space you are looking for. Cross border mail delivery takes a week. 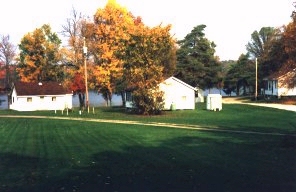 Red Horse Lake is a part of the 18-mile-long Gananoque River System, a quiet series of inland lakes where you don't need fishing guides or rough-water boats. You can fish for Northern Pike, Lake Trout, Largemouth and Smallmouth Bass, and a wide variety of pan fish. We have boats and outboard motors for rent, or you can bring your own boat and launch it on our ramp. We have our own private sand beach for swimming. You can also bring your own equipment for other water sports. Please read this important information about bringing your own boat. There are excellent sightseeing and touring opportunities within a two-hour drive. Driving times are listed in parentheses ( ) after individual listings or cities.